For the second year in succession, John Surtees won the gruelling German Grand Prix at the Nürburgring, with his Ferrari team-mate Lorenzo Bandini coming third and Graham Hill sandwiched between them in second. Practice was marred by the death of likeable Dutch aristocrat Count Carel Godin de Beaufort. 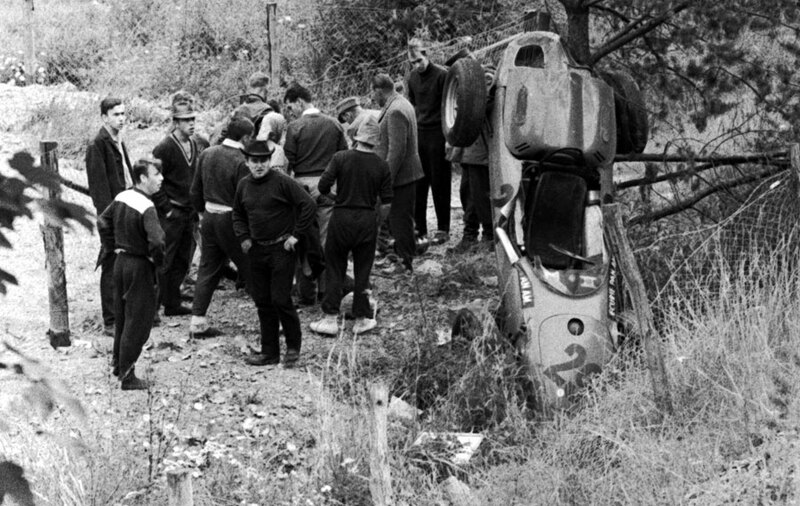 He suffered massive injuries when he was thrown from his outdated Porsche 718 as it crashed and hit a tree, and died three days later. The race saw the debut of the first Honda grand prix car, driven by American Ronnie Bucknum, who had never competed in Formula One before. It was not an auspicious debut, as he qualified at the back of the grid and spun off after 12 laps. Surtees started from pole position as a cold wind whistled across the Eiffel mountains and the 300,000 spectators huddled together for warmth. The Ferrari roared into the lead with Dan Gurney in the Brabham just behind him, but Clark soon forced his way in front. Surtees retook the lead on laps two and three, and then repeatedly swapped position with Gurney as they slip-streamed each other down the 160 mph straight, pulling away from Clark and Graham Hill. Clark dropped out on the 7th lap with a broken engine and on lap 11 out of 15, Gurney came into the pits with overheating problems. He rejoined back in fifth, but a lap later had to retire as the boiling engine was unable to cope. Surtees sailed home with Hill not even in view, describing his race as "a fine, trouble-free run". A good spectacle on a bitingly cold day came to an appropriately exciting end when veteran Maurice Trintignant, in his last Formula One season, pushed his BRM up a slope and over the line for fifth place and two championship points. Surtees moved up from seventh to third in the championship, 13 points behind leader Hill and 11 points behind second-placed Clark.